Rustic Fence, Inc. can design wood fences to serve all of these beneficial purposes, but mainly, a professional wood fence can create the atmosphere you want for your yard or business. Think about it: A tall fence can create a sense of intimacy, security and privacy. A small fence can nicely segment a garden, compost or storage area. Above all, the style of fence you choose should meet two purposes. It should be visually appealing and functional. Visit the photo gallery to see some of our custom built wooden fences and call us to get an idea of your own moving forward. 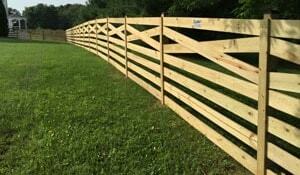 If you have a damaged, weathered or just an old fence, we can help you. We have the ability to match your current fence if you’re adding on or simply repairing a damaged section. Our experts can repair any fence and are happy to provide you with a firm, free quote. Contact us today for more information. We’ve been building and installing wooden fencing for decades now and our experience is accompanied by expert knowledge and craftsmanship. You don’t have to settle for a simple wooden fence any more. We can craft a truly unique enclosure that matches your property and personal taste. You’ll speak with the owners directly — no pushy salespeople or middlemen. Please feel free to look at our wood fence photo gallery and contact us for a free quote today! We’re a full-service professional fence contractor providing a complete range of fence installations and fence repairs serving homeowners, general contractors, home builders, architects, landscapers and more. We have an outstanding reputation for service and workmanship and provide quality results on any size project. 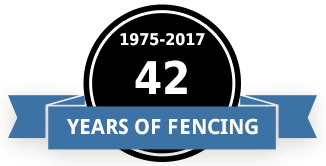 Our comprehensive product selection allows our customers to make educated height, style and material choices to best suit their fencing needs at competitive pricing. Be sure to visit our photo gallery!